Dan Slott and Sara Pichelli remind us how much we've missed the First Family and why they matter to the MCU. What is the Marvel universe without the Fantastic Four? That's a difficult question that many fans have had to answer since the conclusion of Secret Wars in 2015. Since then, Marvel's First Family has been absent, scattered, or a solemn combination of both. The reasons for the limited presence (and status) of these characters are many and prone to speculation, ranging from bitter disputes over movie rights to simply not having a place in Marvel's ever-evolving landscape. Whatever the reason, there's one inescapable truth. The Marvel universe just isn't whole without the Fantastic Four in it. Their absence is a glaring flaw in a world that was built on a foundation that Reed, Sue, Johnny, and Ben helped forge during the golden age of the Stan Lee/Jack Kirby partnership. While many other Marvel heroes have seen their star rise, the Fantastic Four only ever seem to decline. Regardless of which hot new superhero emerges or who gets an overdue overhaul, it's never a matter of whether the First Family will ascend once more. It's just a matter of time, opportunity, and vision. 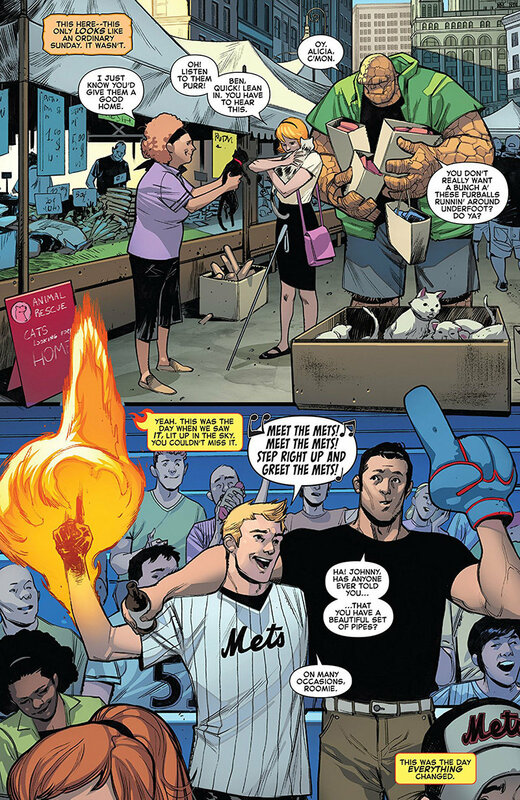 With Fantastic Four #1, that moment is here. 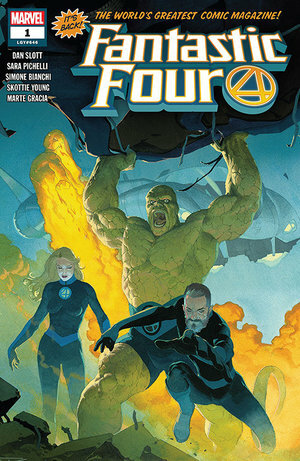 Dan Slott and Sara Pichelli are poised to reaffirm the Fantastic Four's importance to the Marvel universe. Overall, they succeed in almost every meaningful way. The most important thing they do is demonstrate how much the Richards family is still missed. It's not just Ben and Johnny who miss them, either. Many of their close associates, including Medusa, Crystal, and Luke Cage, all get a chance to say how they feel about a world without the Fantastic Four. They don't need Reed's vast vocabulary to make clear how much that world is lacking. That sentiment starts as simple longing on Ben and Johnny's part. There's this underlying feeling of solemn, but uplifting nostalgia. They both handle it very differently, though. 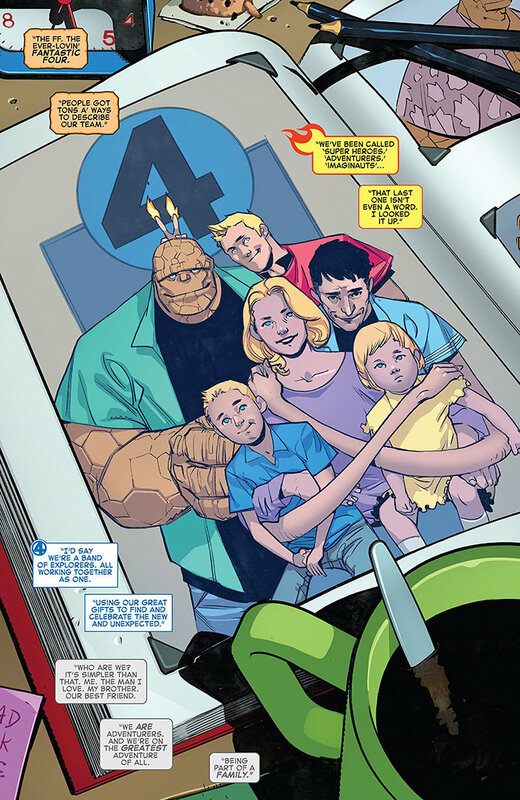 Throughout the story, Ben is more resigned to the idea that Reed, Sue, and their kids are gone for good. It still hurts, but he's trying to move forward with his life. He even has a chance to make an important life decision with Alicia. From Ben's perspective, the best way to deal with the lost of his old family is to build a new one. That's not Johnny's approach, though. In fact, he's downright offended by Ben's methods. Johnny, being the literal and figurative hot-head of the bunch, isn't inclined to move forward. He resists any inclination to just accept that the Fantastic Four are gone for good. He clings to the idea that Reed and Sue will find a way, as they often do. Considering that these two can outwit Galactus, navigate the negative zone, and resist Namor's efforts to undermine their marriage, his faith in them is not entirely misguided. That doesn't make it any less frustrating for him, though. To some extent, Johnny's anger towards anyone who accepts that Reed, Sue, and their kids are never coming back reflects that of every Marvel fan who misses them. It goes beyond the comics themselves. The marginalization of the Fantastic Four is hard to miss, even for those who don't follow news about mismanaged movie rights. Given their importance to the history of Marvel and the way the landscape of Marvel has unfolded without them, a little frustration is understandable. It culminates in a powerful moment when Slott captures that feeling perfectly through Johnny. Rather than celebrate the progress Ben makes in his personal life, he lashes out at the stars where he and the First Family got their powers. He says what so many others have thought, felt, and articulated in fan mail. Reed Richards is one of the smartest beings in the Marvel universe. No secret war, incursion, or Disney lawyer can keep him and the Fantastic Four apart. He shouldn't need a reminder, but Johnny gives him one anyway. This isn't just another superhero team that can form, dissolve, and join a super-powered civil war within the same week. The Fantastic Four are a family. No matter how many planet eaters there are, family finds one another. That's something that no Avenger, X-men, or Champion can match. In the end, both Johnny and those who share his frustration get a welcome and overdue answer. It's both a sign and a gesture of reassurance. The Richards family is coming home. The Fantastic Four will be whole once more. 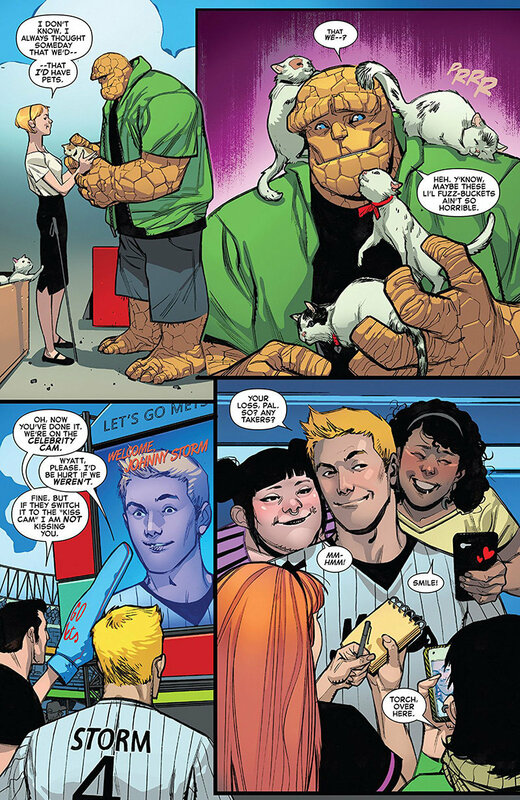 That sentiment, built around the affirmation that the First Family is coming together again, is Slott and Pichelli's most important achievement with Fantastic Four #1. This isn't just a team reforming after a dramatic schism. This is a family finding itself after being torn apart by forces that literally ripped apart the multiverse. Regardless of how much or how little you missed the Fantastic Four during their prolonged absence, it's easy to appreciate that longing these characters feel to be whole once more. Slott and Pichelli evoke the right emotions throughout Fantastic Four #1, but the story isn't without shortcomings. As a whole, it comes off as more of a prelude rather than the first issue of a larger story. Even though Reed and Sue make an appearance, there are times when the story feels more like a movie trailer than the start of a new chapter for the First Family. The inclusion of a flashback sequence didn't seem to contribute much to the plot, either. That doesn't make the emotional weight of Fantastic Four #1 any less impactful. It still sends the message that Fantastic Four fans have been waiting to hear for years. The First Family of the Marvel universe is coming back and they've been sorely missed. While they probably won't solve every lingering problem with superhero civil wars and pushes for diversity, they'll still be together. For any family, that's the most important part of any challenge.